1: I was lucky enough to meet Sir Terry Pratchett, one of my all time favourite authors, in my second year of university. Instead of saying “hello” like a normal human being, I made a high-pitched squealing noise the likes of which I’ve never made before or since. It was not my finest moment. 2: I re-read The Lord of the Rings all the time. I first read my dad’s copy [pictured] when I was 11 and I was hooked from there. That copy is held together by lashings of sticky tape and sheer force of will. Seriously. Every time I re-read it another page would start to work its way loose. That book is 90% tape at this point. Eventually my parents bought me a fresh copy of my own, but I still keep this one for sentimental reasons. 3: I used to be a bookseller. This is when I amassed the majority of my book collection thanks to a) staff discount and b) free books from publishers, which was both a perk and a curse. A perk because YAY BOOKS! A curse because…well, about 90% were unsolicited and there just wasn’t enough time in the day. 4: I enjoy reading picture books. This started when I was a bookseller. I used to do Sunday Storytime with the kids, which involved reading them three stories, so yeah, I managed to work my way around a large amount of that area. I don’t get to read as many now, but there’s plenty of cousins, nieces and friends’ kids to read to these days. 5: Sam Vimes from the Discworld series is my most favourite character of all time. I can’t fully explain this one, but he is. He just is, OK? Guards, Guards, was the first Discworld book I ever read and clearly he just imprinted on me. 6: I read at speed. But I’m not a speedreader. I have previously read 31 books in 31 days and I do read every word. I once read the entire Hitchhiker’s Guide to the Galaxy series in a day. Mostly because I loathe putting books down midway through a story. If I can avoid it I will, so it means I tend to read a book in one hit (unless I’m hating it, in which case it may take longer). 7: I’m getting married and my wedding bouquet will be made from the paper of old books. I’m thinking something like this. 8: I read a mix of YA and adult books and my favourite genre is fantasy. 9: I really enjoy sewing and have amassed an entire shelf’s worth of sewing books. But I actually prefer just reading the books and getting tips, rather than trying those specific patterns for myself. So those are my facts. If you’re taking part in Top Ten Tuesday too let me know – I’d love to find out more about my fellow bloggers! Wow, great post! I’m a knitter and my shelves are slowly getting fuller with books! 31 books in 31 days sounds incredible! I don’t think I could do it with all the other commitments. You have my respect! And a bouquet of book pages sounds amazing… excuse me whilst I go and make my own wedding plans (congrats, by the way!). Thanks Hannah! I’ve tried knitting before but I can never get the tension right, need to keep practicing I think! It was the most brain melting challenge I’ve done, but in all fairness it was back when I was working as a bookseller so I had a little more time to read outside of work. I don’t think I could do it now! YES!! That bouquet and tutorial was one of my favourite finds on Pinterest (love Pinterest, may be a teensy bit addicted to it). I’m going to give it a whirl making my own bouquet, fingers crossed it turns out alright! How exciting that you got to meet a favorite author! And maybe not your finest moment (hee hee) but you’ll always have a great story to tell. 🙂 Confession: I’ve never read LOTR and have never felt the need to. Eeek! 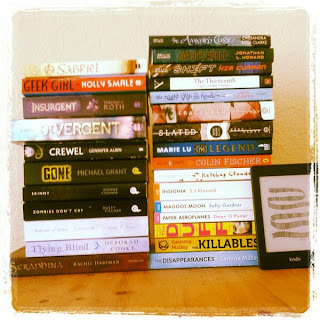 31 books in 31 days… I am in awe. LOVE the idea for your wedding bouquet! What a wonderful way to personalize your wedding! I think my brain was utterly melting by the 31st day but I’m glad I did it (not sure I have it in me to do it again though! ).